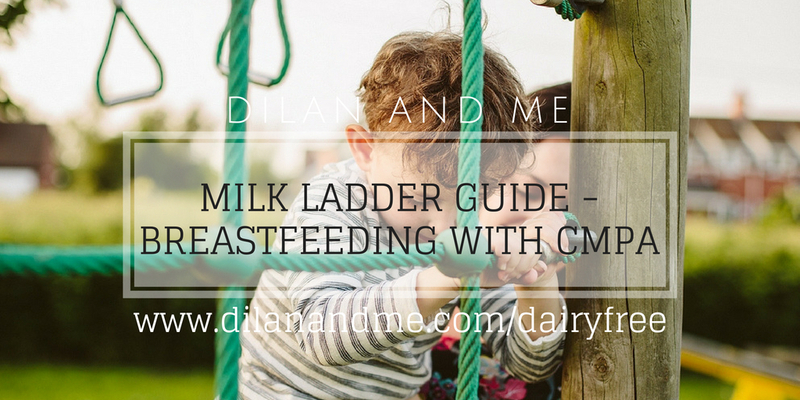 Some of the most frequently asked questions in my Breastfeeding with CMPA support group are about the milk ladder; what it is, when to do it, how to do it and what to look out for. So today I’m going to be explaining as much as I can, and hopefully answering a lot of the common questions. Settle in because this might be a long one. For more information about cows milk protein allergy check out all of my breastfeeding with CMPA resources including the dairy and soya free treat list, other frequently asked questions, how to confirm CMPA and a comparison chart of the alternative milks. As always this information should not take the place of personalised medical advice from a health care professional. Sometimes HCPs give out questionable advice, so I strongly suggest that you research things for yourself, question things that don’t sound right and make sure you’re taking the right action for your child. What is the milk ladder? To understand what the milk ladder is we have to get a bit sciencey about CMPA for a second. Cows Milk Protein Allergy is obviously an allergy to one of the proteins found in cows milk. When these proteins are heated they begin to denature, or change shape, making them less allergenic or meaning that it’s less likely a CMPA child will react to them. The very bottom of the ladder includes items that have been heated for a long period of time, and as the steps increase the milk proteins have been heated for shorter and shorter periods, moving up to raw milk. It’s very possible for CMPA children to tolerate up to certain points on the ladder without being ready to reach the top. Who is the milk ladder for? This is often the first point of confusion about the milk ladder. Despite the official guidance being very clear I think people are sometimes given poor advice from their health care professionals on this one. The milk ladder is to guide the reintroduction of dairy at home and therefore it is only for children over the age of 9 months (preferably 12 months+ in my opinion), who have confirmed mild to moderate non-IgE CMPA. If you haven’t confirmed CMPA yet then the milk ladder is NOT what you need. Please read my post on confirming CMPA. If you aren’t sure on the differences then head to the FAQ pages. If your child has IgE CMPA, or if they have had serious reactions in the past then it is not safe for you to begin reintroduction at home without the input of a trusted dietitian. 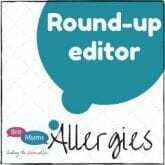 If you’re not sure what type of allergy your child has, or you have a reason to suspect they may have a severe allergy (for example if you have confirmed they react through breast milk but they have never consumed it directly) then it’s very important that you do not introduce dairy at home without medical guidance. Speak with your dietitian, or ask your GP/HV for a referral if you haven’t got one already. With the help of a HCP (healthcare professional) you may be able to start the lower levels at home once it’s been determined to be safe, usually with more skin prick tests and hospital challenges. Once Dilan passed his baked milk challenge in hospital we were cleared to try the baked milk steps of the ladder at home, but we would not go any higher. When should we start the milk ladder? As above the milk ladder should only be started with children aged over 9 months, preferably closer to 12. This is because statistically a large percentage of babies with CMPA will outgrow it by the age of 1. It should also not be started within 6 months of a reaction. So if you have a dairy slip up and see a reaction then you should be waiting at least 6 months before attempting the milk ladder. This is to allow them to recover and their gut to heal, as well as making sure you start it when there is a good chance they’ve outgrown the allergy. If your baby reacted to milk a few months ago then it’s unlikely that they will tolerate it small amount of time later. You want to start the ladder when you believe there is a good chance they have outgrown the CMPA, or will at least pass the first few stages. Your child should also be fit and well so that you will be able to see a clear reaction instead of wondering if it’s a cold/bug/etc. Which milk ladder should we use? If you take a look on google you will find several different versions of the milk ladder. The original MAP Milk ladder is the 12 step version, which is the one most of us are familiar with. The home made MAP Milk ladder recipes are great especially if you’re dealing with multiple allergies, because you can make them wheat/egg/etc free. The newer version of the ladder (iMAP Milk Ladder) has been shortened to 6 steps, and has specific iMAP Milk Ladder Recipes. My thoughts are that this ladder jumps stages very quickly, and I personally wouldn’t want to jump from pancakes straight to raw cheese so I do prefer the 12 step ladder. The ladder I prefer to use myself is the NNUH Milk Ladder, which breaks each stage down into smaller stages – great for those taking the ladder slowly. This is definitely the best one to choose if you have seen more moderate/severe reactions previously, and it also gives a great list of alternative choices for stage 2 and 3 so it’s great if you’re struggling to find something your child will eat. Should the milk ladder be done directly or through Mum? The most debated question. Here are my thoughts on it. How much of each stage do I give? This question is not easily answered because it my opinion it’s very dependent on the child and the situation. Depending on how your little one reacts, what kind of slip ups/exposure they’ve had previously and the symptoms they’ve displayed. Also depends on how nervous you feel, because I do think that needs to be considered. If you have a lot of concerns about starting the milk ladder, or you are concerned that your child’s reactions may be more extreme then you can start with a very small piece of malted milk, and take it as slow as you need to. There is no need to rush through the ladder, so starting with half a malted milk or even less is totally okay. For Dilan, because his allergy is IgE we started with a crumb of malted milk, and we took it very very slowly in the hopes that if we did see a reaction it would be mild. Conversely if your child has never seemed to react to small amounts then you can start with a whole malted milk and move through the ladder quicker. How long should we stay on each stage? As above this is very dependant on the child, and also dependant on how slowly you go and when you get to a full portion of the stage. You should consider moving on from a stage once you are confident that your child is tolerating that specific level as a normal part of their every day diet. As a non-IgE reaction could present within 72 hours you should wait at least 3 days before ruling out a reaction and moving to the next stage. I would probably suggest that a week at each stage would be good for most situations. Personally as our situation is IgE but we passed the baked milk hospital challenge we spent 2 weeks at a crumb of malted milk, and then spent 2 weeks at a 1/4 before moving up to a whole biscuit. Once we got to a whole biscuit I just kept them in his diet regularly. So you can go at whatever speed you need to. What kind of reaction am I looking for? Basically if you notice an adverse change in your little one after starting the milk ladder and it’s not down to anything else like a cold/bug/teething that you should consider it a reaction. I know that sometimes it is incredibly hard to determine whether something is a symptom or reaction when your little one is constantly either teething or picking up colds (been there!). There’s no easy way for you to know which it is. Sometimes you might find that you start the ladder, see a potential reaction and stop, and then notice a new tooth coming through. It is a bit of a guessing game, and you do just have to do your best with it. What about a build up reaction? Sometimes we see what we call a build up reaction, meaning a child didn’t react after the initial allergen exposure, but is seeming to react now that they’ve been continually exposed to the same level for a few day/a week/etc. This is why I say that before moving on you need to be sure they are tolerating it as a normal part of their diet, so that should rule out a build up reaction before you move up. What kind of alternatives can I use for each stage? For each stage you can again use the recipes above to bake your own, or have a look at the NNUH Milk Ladder for some more options. Once you pass one of the options you could decide to try a few of the other choices as well before moving on to the next stage. An important note about crisps: I know that the NNUH ladder lists crisps with milk in the flavouring at stage 2, but they have since discovered that lots of crisps have their flavouring added at the end of the baking process so the milk proteins are not heated for long. This means they should really be much higher up the ladder and are more likely to cause a reaction than baked milk. Once we pass a stage should I continue to give it every day? Once you have passed a stage on the ladder this level of milk protein the guidance states that it should be kept in their diet on a regular basis. I totally understand the concern of parents when they read the ladder and start thinking their child needs to be eating 3 biscuits a day, plus a muffin, plus whatever else. My personal advice would just to be include these items in their normal diet. So for example once they have passed malted milks, if they were going to have a biscuit then offer a malted milk. Once they have passed products containing cooked cheese then offer meals like lasagne, shepherds pie and custard as a normal part of your family meals. Don’t get stressed about exactly how many malted milks your child is eating a day once they are moving up the ladder, as long as you are including the levels that you have passed in their diet regularly than you will be fine. If you find your child fails a certain step (more on that below) then you do need to keep the foods that they did pass in their diet. The reason for this is that studies show that exposure to an allergen may increase the speed that the child outgrows the allergy, so keeping the level of milk that they tolerate in their diet may be beneficial. When should we stop the milk ladder? Personally I would advise you to stop the ladder as soon as you see what you are confident is a reaction. You do need to be sure, so if you suspect it may be teething or a cold then I would continue to do a few more days at the same stage. Once you think it is a reaction I would stop. If you stop and the symptoms improve quickly you’ll know it was probably related to the ladder. Continuing to do the ladder when you are seeing symptoms like gastro issues and eczema flairs is not a good idea in my opinion. If you are seeing external problems then who knows what could be going on inside, and the last thing you want to do is cause more damage to your child’s gut. It’s not worth it, there is no point rushing it and putting your child at risk of more problems. Although there may be a benefit to getting a small amount of milk protein into them, the risks outweigh any potential positives on this one. If you fail the milk ladder at the first step you should stop, and not attempt the milk ladder again for at least 6 months. The next time you start the ladder you may want to consider taking it slower and starting with a smaller portion (less biscuit). If you fail a little further up the ladder then it would usually be advised to go down one step and stay there. I would probably want to want another 6 months before attempting the next step again, but that will be child dependent and also depend on what kind of reaction it was/how sure you were that it was a reaction and not something else. Progress with caution when you’re ready, or move over to a different ladder and begin to progress on that one (more on that coming soon). 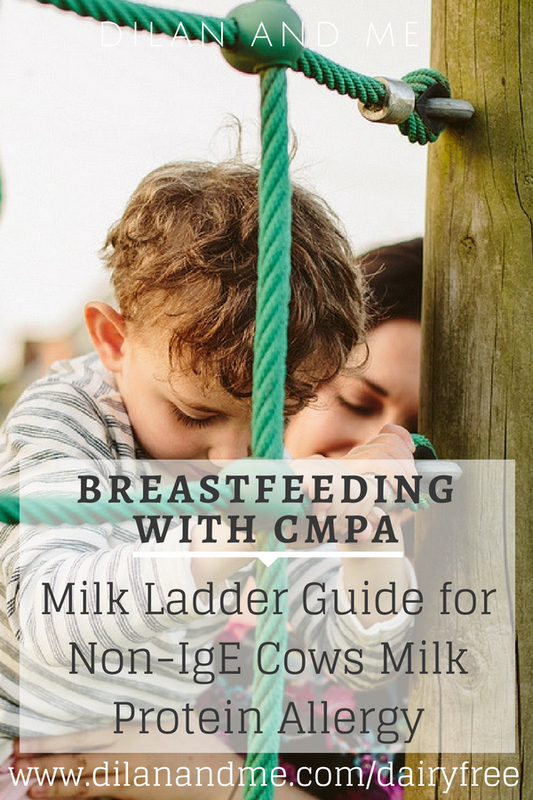 Will not doing the milk ladder mean my child won’t outgrow their CMPA? No. I know that lots of people like to talk about how important it is to get your child consuming a small amount of milk protein to help them outgrow their allergy; but if that comes at the cost of damaging their gut, causing stress and food aversions or further problems then it’s not worth it. As I have said before – Yes, introducing small amounts of milk protein may speed up the time it takes your child to outgrow the allergy, but not introducing milk protein won’t mean that your child never outgrows it. There is no rush to get on ladders or shoot up them, and the priority should always be your child’s health and well being. Hopefully this has answered some of the more commonly asked questions about the milk ladder. As always for more personal advice reach out to my Breastfeeding With CMPA support group, and myself or one of the admin team will be happy to help. I know that some of you have some questions related to milk ladders and multiple allergies, which I will include in a separate post because I’m aware that this one is getting very long! I will cover which ladders to start first when dealing with multiple confirmed non-IgE allergies, and how to manage more than one ladder at a time. Previous Post Come See Me at The Allergy and Free From Show 2018! We’ve been on the milk ladder for 4 years now! Going up and down it! It honestly felt easier just not having anything. Arlo is fine with up to baked cheese but we can’t seem to get past that. Like you say, crisps should be much higher, he definitely reacts to those. Something I found out the other day that I didn’t read here that I found interesting is it’s not just about how long something is baked for but what the other proteins are in the food. For example, baking a cake – the milk proteins will bind to the wheat proteins and that reduces how allergenic they are too. I’ll try find the article if you haven’t read it.